Nap Time is the New Happy Hour: Uh Oh No Valentine's?! Me: "So, should I go ahead and get Valentine's for C's class?" A rhetorical question to be honest. Hubs: "No, that is crazy, he is two years old. the parents and teacher will think you are nuts." I mean I like to do that kinda stuff. What do you mean people don't like to do that "crafty stuff"
everyone likes to make pretties." Hubs: "No, no they don't. So, I actually listened to my husband for once. I never, ever, listen to him about this kinda stuff. I normally just talk to talk and I think I was actually shocked that he respondend to me and listened for once that I actually listend back. Well, enough with the listening. and a million things on my plate. They hand me his daily report which was of course perfect, but there was a list of all the kids in his class names on the back. So of course I ask what the names are for. Hello, Cheryl, obviously the Valentines party that is on, well, Valentines Day. I can't even tell you how annoyed I was. A type A to the T.
I did not plan to have to go out, after I was just at the grocery store mind you. I have to go out with a ravenous toddler. Why, oh why did I listen to my husband. I should have gone with my gut and whipped up some cute personalized Valentine's. C must have the cutest Valentines in his class. I must be a super mom. Now, I can't just run to the store and by the boxed kinda with candy. Nope, I have to hop onto Pinterest and find a cute printable and send it of to Kinkos. I picked this printable from One Charming Party. well for a Last minute V-Day they are adorable.. My rule is never listen to my Hubby when it comes to stuff like that.. Ha Ha They don't really know. I bet he was super excited to give those out at his party. Not too shabby at all! I did my son's valentine's the night before he needed then. At midnight. Thank goodness for free printables! I'm with your husband. 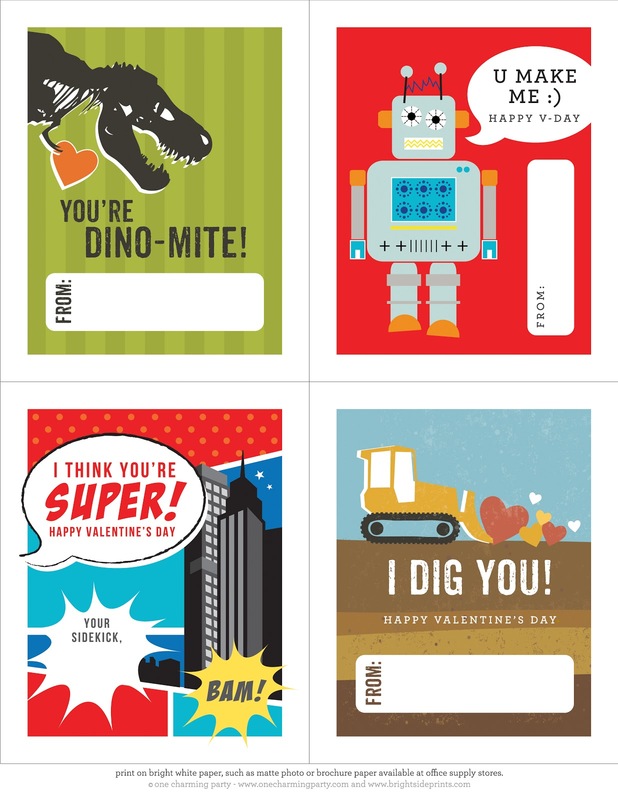 I'm surprised they would do Valentines with 2-year-olds. But great job, Mom, on getting some cute and very original Valentines!